Legendary real estate developer Mel Sembler founded The Sembler Company in 1962. More than half a century later, the company is still recognized for adaptability, creativity, stability – and passion for its employees, for the communities in which it operates, and for the projects it chooses to take on. Sembler’s business savvy built one of the most accomplished full-service real estate firms in the industry – and his heart for service remains at the core of the company’s day-to-day operations. 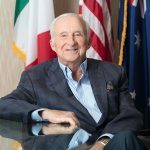 In addition to building The Sembler Company, Mel Sembler served his country as United States Ambassador to Italy from 2001 to 2005, and as U.S. Ambassador to Australia and Nauru from 1989 to 1993. As the President’s personal representative, he actively promoted the United States’ interests abroad during his two terms of service. At the recommendation of the Governor-General of Australia, and with the approval of Her Majesty, Queen Elizabeth II, Sembler was named an Honorary Officer in the Order of Australia in October 2000 – an honor rarely given to foreigners. A passionate civic and political activist, Sembler’s counsel and opinions are regularly sought on the world stage. He has played a leadership role in several Presidential fundraising campaigns, including serving as Finance Co-Chairman of The American Bicentennial Presidential Inaugural, raising the dollars needed for the nation’s 41st inauguration of the President of the United States. Sembler also held the role of Finance Chairman for the Republican National Committee from 1997 to 2000, and was elected Florida’s National Committeeman to the Republican National Committee, serving from 1994 until 2000. His work as a staunch anti-drug activist and founder of adolescent drug treatment program STRAIGHT is well-known. Sembler has also held a number of leadership roles within the real estate development industry, including a stint as the international leader and spokesman for the shopping center industry from 1986-1987 as Chairman of the International Council of Shopping Centers – a position that capped 25 years of active service to this worldwide trade association. He is presently on the boards of the International Council of Shopping Centers, American Enterprise Institute, George Bush Presidential Library Foundation, Republican Jewish Coalition, and Moffitt Cancer Center. Sembler is also a sustaining member of the Florida Council of 100, a business advisory council to the Governor of Florida. Born in 1930 in St. Joseph, Missouri, Sembler is a 1952 graduate of Northwestern University, where he earned a Bachelor of Science degree. He and his wife Betty have three sons, eleven grandchildren and five great grandchildren.